A reliable source for Storage Platforms information and a resource for accessing leading Storage Platforms and suppliers. Storage platforms are mezzanines used for temporary placement of materials and equipment. Many public, commercial, warehouse and industrial buildings make use of storage platforms to increase existing floor space for storage. Every industrial operation, particularly those that operate in warehouses and factories, must contend with the issue of efficient space utilization. As a warehouse or factory-based business grows, it must find innovative ways to use its space efficiently. But these innovations can only go so far, as space is never unlimited. Eventually, a growing company will reach the limits of its storage or workspace capacity. A company that faces this problem has a few options. The company can move to new, larger facilities, expand current facilities, do nothing (and face the indefinite stagnation of business) or it can construct storage mezzanine platforms. Storage Platforms Storage platforms are mezzanines used for temporary placement of materials and equipment. Many public, commercial, warehouse and industrial buildings make use of storage platforms to increase existing floor space for storage. Storage platform materials can range from smooth, cold-rolled steel to grated or treaded varieties of other metals. Depending on the materials to be stored, the weight of those materials and the frequency with which materials will be moved on and off of the platform, certain materials and configurations can be more appropriate than others. Storage Platforms - Abtech, Inc. Some storage platforms are equipped with accessories like conveyors and lifts to simplify the transportation of heavy or bulky products on and off of the platform. Storage platforms are supported by a collection of beams and columns, both of which must be arranged in a way that minimizes impedance to operations beneath the platform. Storage mezzanines can be free-standing or structural. Free-standing storage mezzanines can be introduced to existing operations and placed around machinery. They are used as expansions of storage space for growing operations. 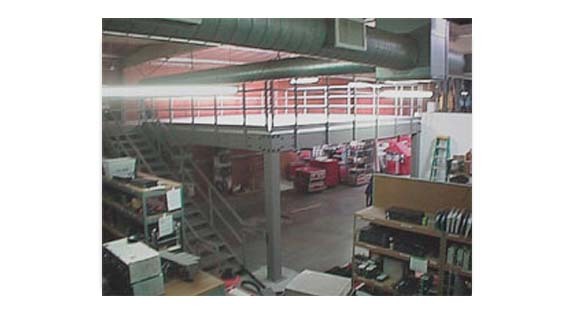 Structural storage mezzanines are integrated into the structure of buildings and are permanent. They are less modular than free-standing models, but they can often be sturdier because they are supported by permanent structural support components.